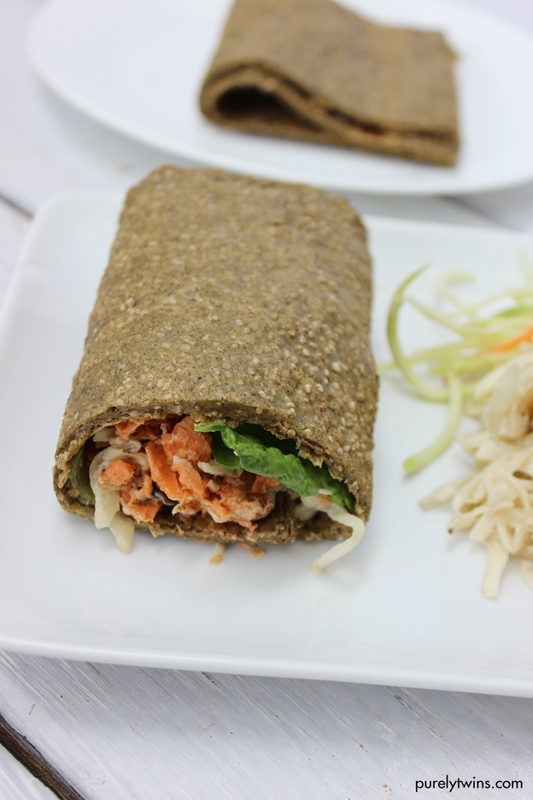 Healthy 5 ingredient protein wrap that is filled with fiber. Egg-free gluten-free grain-free hemp protein chia seed wrap. Can be made sweet or savory. Make chia gel first by taking the 1/4 cup chia seeds in a bowl and add the 12 tablespoons water to it. Let it sit for a good 10 minutes to create a gel-like texture. Place plantain, hemp protein, baking soda and baking powder into a Vitamix blender or food processor. Next add in chia seed gel. Blend all ingredients together until it is well combined. Pour mixture onto a large cookie sheet and spread mixture. You want the mixture to be as thin as you can get it. Bake wrap for about 20-25 minutes or until firm to touch. Remove from oven and let cool. Cut into desired sizes for wraps and fill wrap with any toppings.